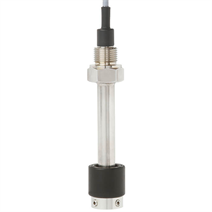 The innovative model GLS-1000 float switch has been developed for monitoring the levels of liquids. It combines the advantages of the proven and robust float-based measuring principle with modern digital switching technology with PNP and NPN output signals. The GLS-1000 is suitable for a multitude of media, such as, for example, oil, water, diesel and refrigerants. A permanent magnet built into the float, through its magnetic field, activates the semiconductor sensors built into the guide tube. The switching operation is contact-free and free from wear. Since no mechanical switching process is triggered, the sensor offers an unlimited number of switching cycles. Depending on customer wishes, the switching functions of normally open and normally closed can be realised as PNP or NPN outputs for the defined switch position.